The Harvest Vehicle HV-100, also known as Harvey the agricultural robot, is the latest creation from Harvest Automation, a firm based in Massachusetts. Harvey will begin moving potted trees and shrubs in plant nurseries. These are bunched closely together in winter, spaced wider in summer and rearranged as they get bigger. There may be hundreds of thousands of pots at one nursery and, says Greg Timbol, in charge of business development at Harvest Technologies, each pot typically needs to be moved at least five times, at a labour cost of about two cents per move. Hence the opening for a robot. 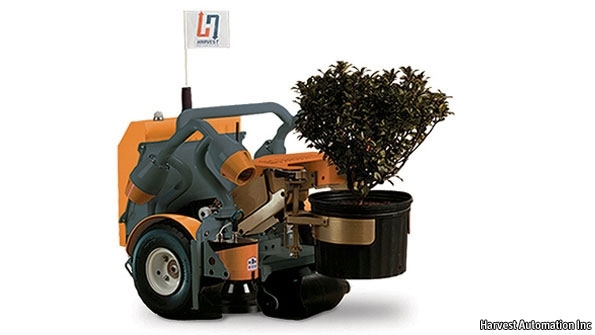 The robot is a battery-powered machine weighing 40kg with grippers to move any pots of up to about 10kg. It is designed to work safely alongside humans, unlike industrial robots which have to be fenced off to prevent accidents. And it can beaver away in all weathers, day or night. 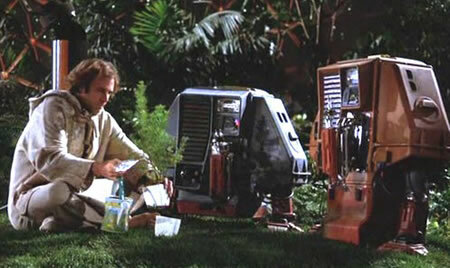 Remember the 1972 sf movie Silent Running, in which Bruce Dern took care of his garden with the help of similar-looking robots? 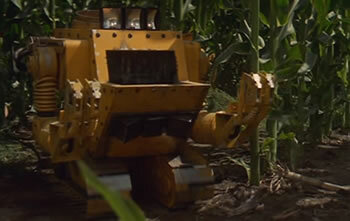 Hopefully, the makers of Harvey will take note of the agricultural pest controller from Michael Crichton's movie Runaway as well. From Harvest Automation via The Economist.